3CDC currently operates four garages in Cincinnati's Central Business District. Daily rates for each garage are included below. Click here to request monthly parking. NOTE: While parking rates listed on the 3CDC website are updated frequently, actual rates may vary at times. In the event that rates on the website should differ from rates at a 3CDC managed garage or lot, the rate at the garage or lot will be deemed accurate, and patrons will be charged accordingly. 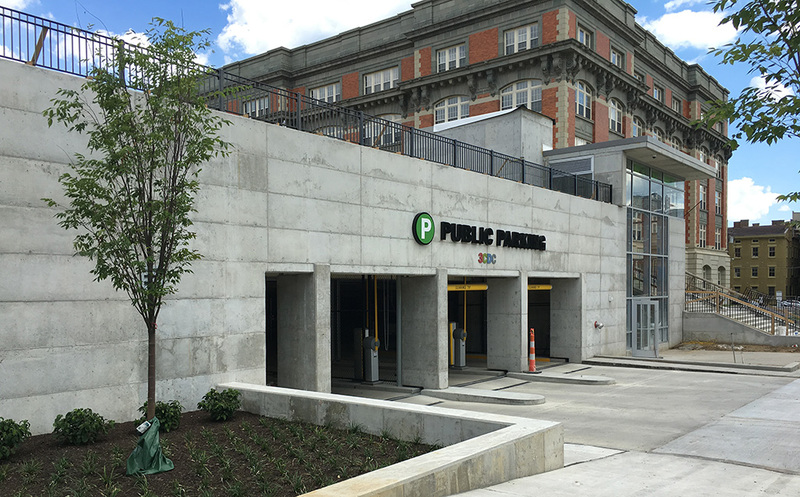 The renovated Fountain Square North Garage has 600 spaces on four underground levels, all-new lighting, ventilation, signage, public restrooms, a new security system and security personnel. 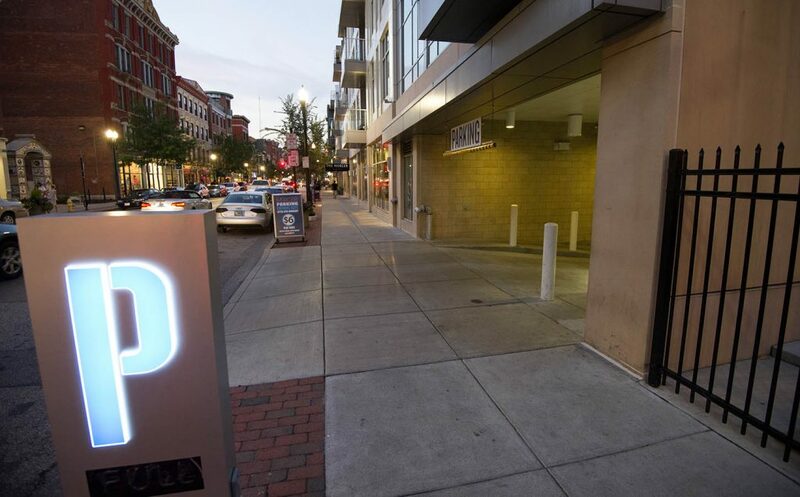 Conveniently located in the heart of downtown, the garage has vehicular entrances/exits on Vine and Walnut streets. For additional information, including Special Event Rates, visit the Fountain Square Parking page. 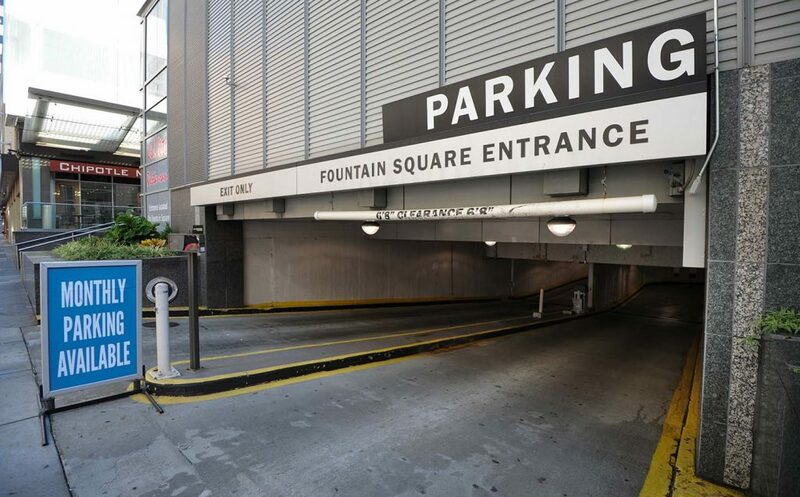 Note: If you have already decided that you would like to purchase monthly parking at the Fountain Square Garage, please fill out this form. If you have additional questions or need assistance in determining which 3CDC-managed garage or lot would best fit your needs, fill out the form below. The large construction project at the NW corner of Fifth & Race streets recently yielded an 1,100-space parking garage. The garage includes six spaces equipped with Level 2 charging stations, reserved for electric vehicles. * Opened prior to Thanksgiving 2014, monthly passes are currently available. Monthly parking passes are available for $180/month. *There is no fee associated with using the chargers, but normal parking rates apply. Note: If you have already decided that you would like to purchase monthly parking at the 84.51° Garage, please fill out this form. If you have additional questions or need assistance in determining which 3CDC-managed garage or lot would best fit your needs, fill out the form below. 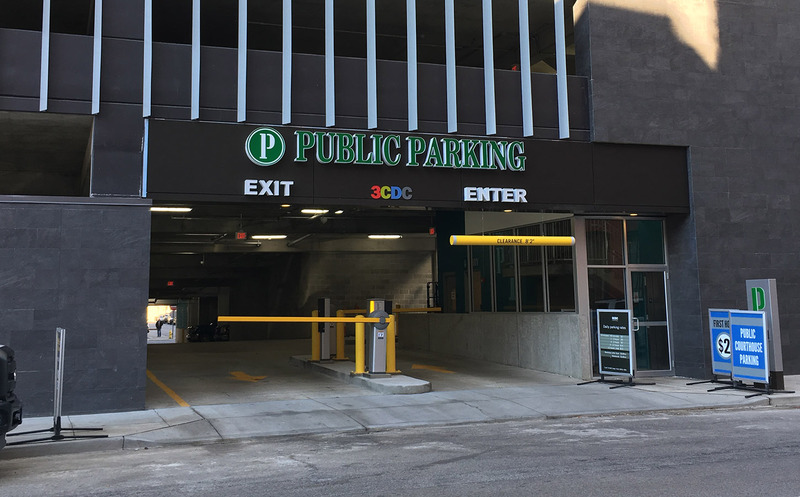 The mixed-use project on Sycamore Street between 7th and 8th Streets in Downtown Cincinnati has yielded a brand new 500-space parking garage. It includes 4 charging stations to serve 8 cars, and these spaces are reserved for electric vehicles. The garage was officially opened to the public on August 1, 2016. Monthly parking passes are available for $145/month. Note: If you have already decided that you would like to purchase monthly parking at the 8th & Sycamore Garage, please fill out this form. If you have additional questions or need assistance in determining which 3CDC-managed garage or lot would best fit your needs, fill out the form below. 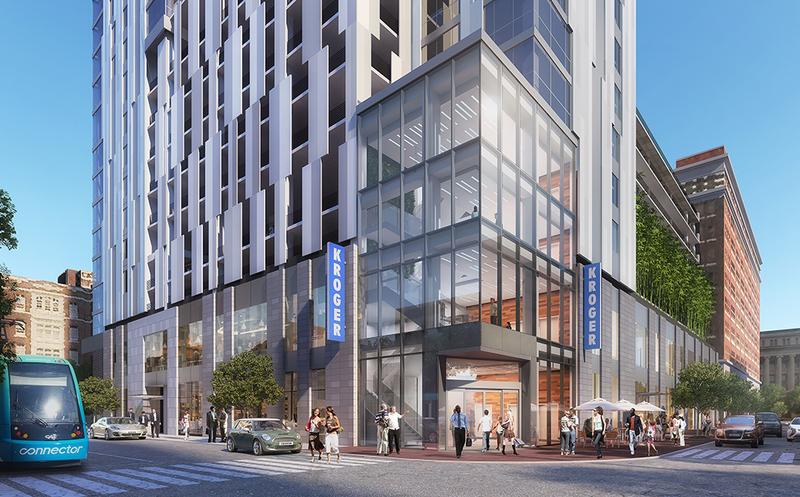 This 560-space garage will be conveniently located at the corner of Court and Walnut streets within the 18-story mixed-use development containing a new Kroger grocery store. With vehicular entry/exit on Central Parkway, between Walnut and Main streets, the garage will include 8 charging stations to serve 16 electric vehicles. The garage was officially opened to the public on February 18, 2019. Monthly parking passes will be available at a discounted rate of $135/month from March - August. Beginning Sept. 1, the normal rate of $150/month will apply. For additional information, fill out the form at the bottom of this page. 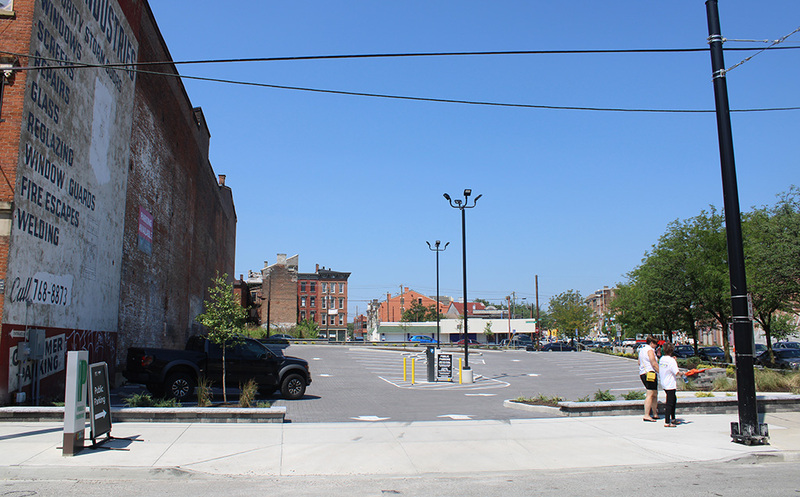 3CDC currently operates three garages and four parking lots in Over-the-Rhine. Daily rates for each garage are included below. Click here to request monthly parking. 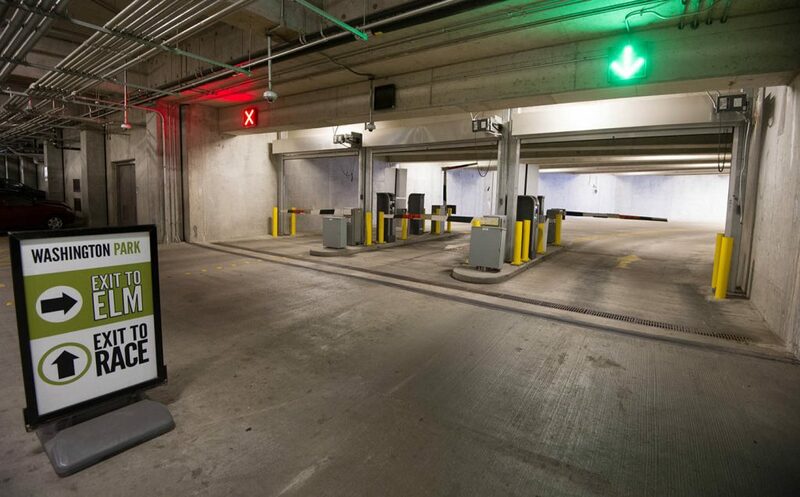 Washington Park's 450-space, two-level, underground parking garage is open and staffed 24 hours per day, seven days per week. Located beneath the northern end the park, vehicular entrances/exits can be found on Race Street at 13th Street, and on Elm Street across from Music Hall. Monthly parking passes are available for $100/month. For additional information, including Special Event Rates, visit the Washington Park Parking page. Note: If you have already decided that you would like to purchase monthly parking at the Washington Park Garage, please fill out this form. If you have additional questions or need assistance in determining which 3CDC-managed garage or lot would best fit your needs, fill out the form below. This 340-space parking garage is conveniently located on Vine Street between 13th & 14th Streets, surrounded by a multitude of recently completed condominiums, townhomes, and commercial spaces. Entry is available from Vine Street, and vehicles exit onto Mercer Street. Note: If you have already decided that you would like to purchase monthly parking at the Mercer Commons Garage, please fill out this this form. If you have additional questions or need assistance in determining which 3CDC-managed garage or lot would best fit your needs, fill out the form below. The parking lot at the northeast corner of 12th & Vine streets has 56 spaces reserved for transient parkers. Vehicular entrances/exits can be found on 12th and Jackson streets, and daily parking rates are in effect seven days per week. The machine DOES NOT give change. Please pay accordingly. Ziegler Park's 400-space, two-level, underground parking garage is conveniently located across the street from the Ziegler Park pool. 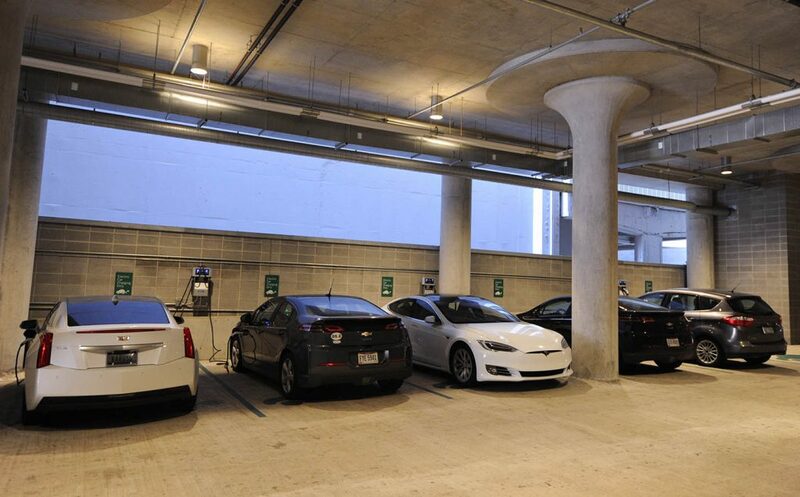 With vehicular entry/exit on Sycamore Street, between 13th and 14th streets, the garage includes 4 charging stations to serve 8 electric vehicles. The garage officially opened to the public in July 2017. Monthly parking passes are available for $95/month. For additional information, visit the Ziegler Park Parking page. Note: If you have already decided that you would like to purchase monthly parking at the Ziegler Park Garage, please fill out this form. If you have additional questions or need assistance in determining which 3CDC-managed garage or lot would best fit your needs, fill out the form below. New day starts at 4 am. Hourly rates are subject to change. Due to the location of this parking lot, rates will fluctuate with demand during special events at surrounding civic spaces and performance venues. Your account will be charged as soon as your card is inserted. Please be sure to read any messaging displayed on the screen carefully, as it pertains to current parking rates. By entering your card, you are agreeing to pay the current rate. 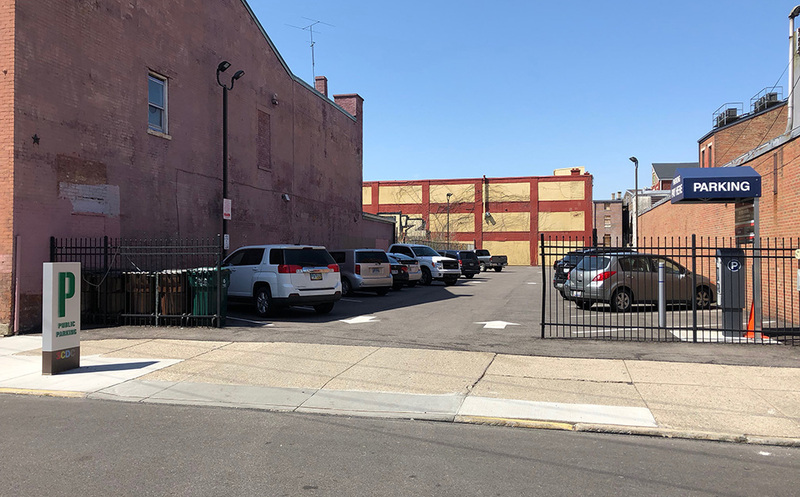 Situated just down the street from 16-Bit Bar & Arcade and the 3CDC corporate offices, this 28-space lot is perfect for both monthly and transient parkers. 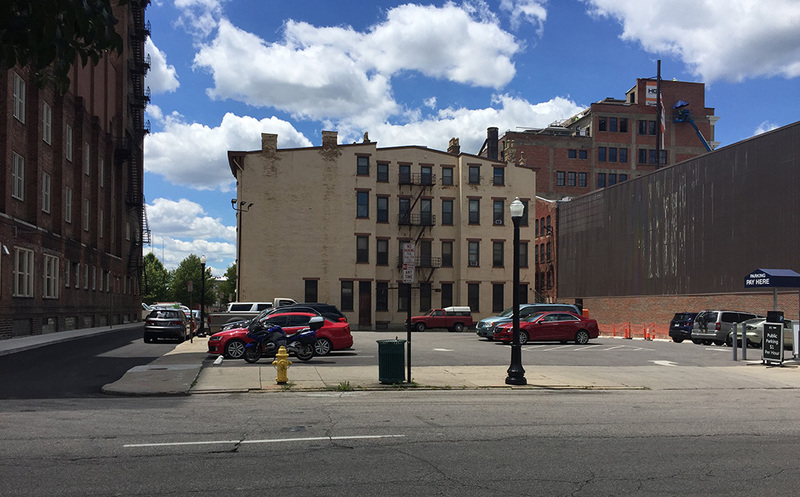 Within walking distance of Ziegler & Washington Parks, numerous bars & restaurants, and other OTR favorites, this lot has a single entrance/exit that can be accessed from Walnut Street. Monthly parking passes are available for $60/month. 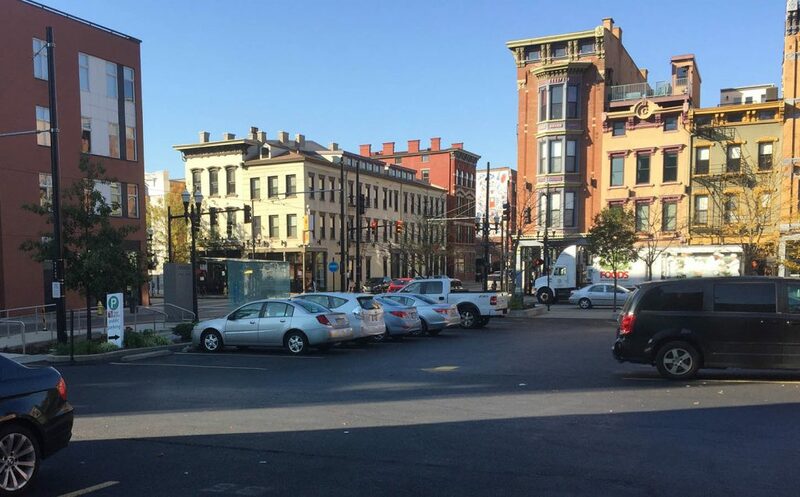 Situated at the corner of Liberty and Race streets, this 50-space parking lot is conveniently located in close proximity to Over-the-Rhine, Pendleton and Findlay Market. Vehicular entry/exit is located on Race Street. The lot officially opened to the public in July 2018.